In today's connected global marketplace, success and failure is bound up with the management of your inter-organisational partnerships. Competition is no longer between individual organisations but between alliances of companies and networks of supply chains. Richard Gibbs and Andrew Humphries provide a practical guide to the management process and skill sets needed for co-ordinating the business activities that are essential to creating a competitive advantage. Their eight partnership types developed from earlier research help readers adapt their relationship strategies to the different opportunities that present themselves and focus their greatest time and resources on the collaborations that offer the greatest value. 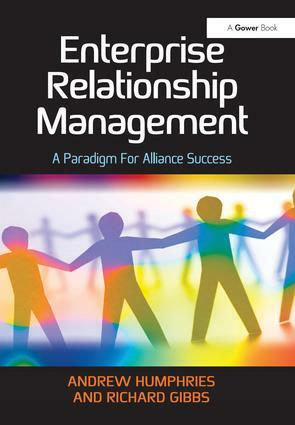 The text includes an explanation of the context for collaboration, the principles and drivers for success, as well as techniques for appraisal and management. This is an excellent overview of the tools, techniques and philosophies behind an enterprise’s successful management of its strategically important relationships. Enterprise Relationship Management will help ensure your organisation has the requisite ability to form, manage, retire and exit partnerships in a fluid and agile way. Whether you are in sales or marketing or finance and operations, this book will show you how to get the most from your partnerships. Andrew Humphries is currently CEO of SCCI Ltd which he founded in July 2004 (www.sccindex.com). He is an expert and thought leader in performance improvement in collaborative business relationships. His scientific diagnostic technique demonstrates how organisations can gain strategic advantage by formally managing their teamwork. It has been used successfully in construction, rail, defence, manufacturing, retail fashion, automotive, IT, food & drink, agriculture and the public sectors in the UK, EU, ASEAN and Australia. A global leader in his field, Andrew is sought after as a conference speaker and author and is a Visiting Fellow at the Cranfield School of Management. Richard Gibbs is a recognised expert in marketing channels and alliance management. His career spans senior sales and marketing positions in multinational companies such as Xerox and Novell Inc. His current research focuses on cross-cultural inter-organisational collaboration in global supply chains. Richard teaches at the University of Winchester.